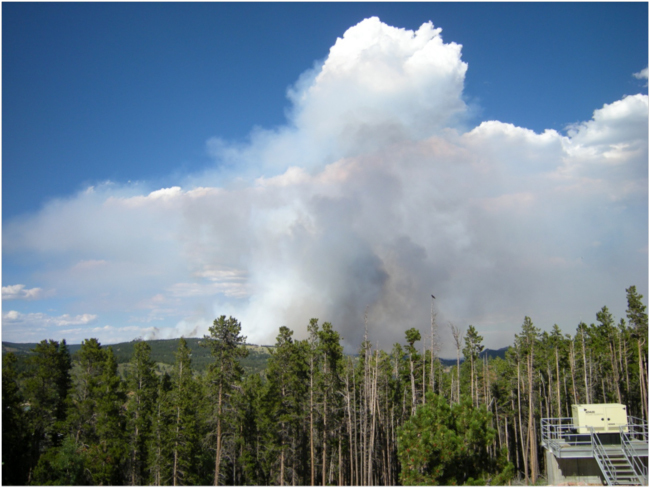 On a trip to Colorado two years ago, in July 2016, I was driving down from a trailhead in the Indian Peaks Wilderness Area after a glorious hike to Arapahoe Pass when I saw the plume of smoke pushing up to the east, high enough to start forming a “pyronimbus” cloud – essentially a thunderhead created by the rising plume of hot air above a forest fire. When I reached the mountain town of Nederland, where I’d planned to stop for an iced coffee at Salto, a cool local café, things were in chaos. Salto’s doors were open, but at the counter they were shutting down on threat of evacuation, so I didn’t get my iced coffee. The road down Boulder Canyon was already closed. Helicopters were lifting buckets of water from Barker Reservoir to drop on houses in the burning hills to the north and air tankers were strafing the ridges with loads of red fire retardant. Smoke plume and pyrocumulus cloud from the Cold Springs Fire, 9 July 2016. Although I was annoyed about not getting my expected caffeine pick-up and very worried about the fate of the cabin of friends in the area that seemed to be burning, I wasn’t especially surprised by another fire in the Front Range. By the time I reached Golden, where I was staying, the Cold Springs Fire was all over the local news. One of my first reactions was: OK, in two years I’ll be back to see if the burned area is blanketed by blanketflowers, as I predict. I’ve written two stories here over the years about my research on a unique moth that I call the “Colorado Firemoth,” whose scientific name is Schinia masoni. 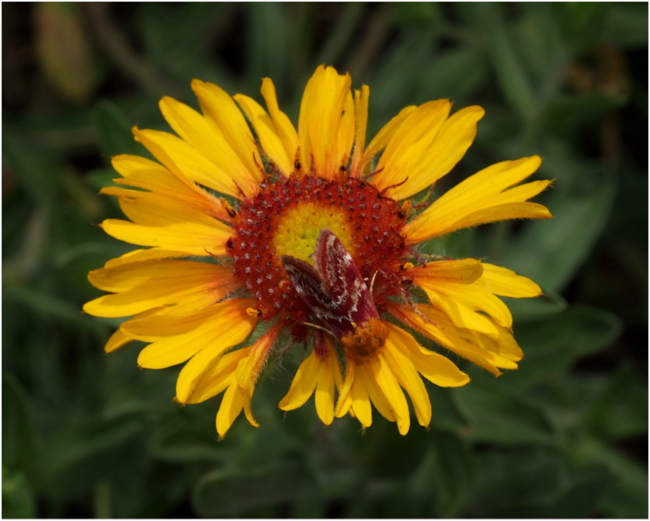 I studied its life history in the late 1980s because of a fascination with its stunning and unique camouflage – it is brightly colored red and yellow to match the colors of blanketflower, Gaillardia aristata, the sole host plant of both larvae and adults. Bright colors are not what people usually think of as “camouflage,” but how you have to dress to hide depends on the background. In the early 1990s I discovered the fire-dependence of blanketflower, and thus of the moths, when visiting a recent burn above Boulder with a class of ecology students. 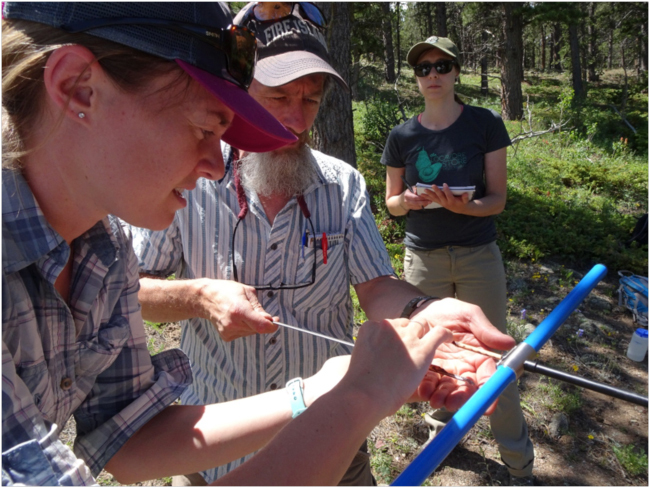 Then, in the early 2000s, I worked with fire ecologists at the U.S. Forest Service’s Rocky Mountain Research Station to gather data on this fire-dependent relationship of moth and flower. 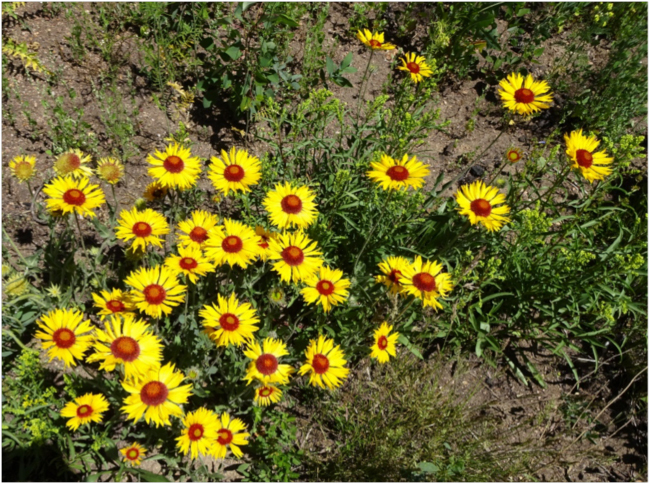 From that research I knew that populations of normally-scattered and uncommon blanketflowers can explode into meadows of them two or three years after a hot strong burn. That research was the source of my prediction about what I’d find this year, in late June 2018, where the Cold Springs Fire had burned in 2016. Colorado Firemoth, Schinia masoni, resting on a blanketflower. Photo courtesy of D. Elin. And…. 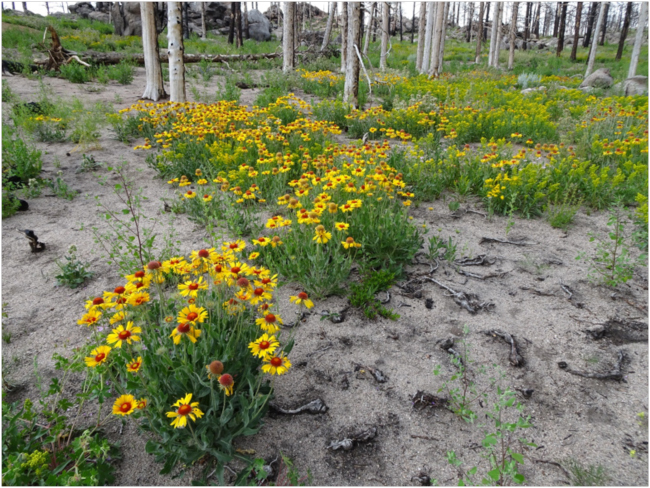 a drum roll (for science) please: Blanketflowers were blooming in beautiful abundance under the charred pines of the Cold Springs burn. Science works! I thought. But what about the moths? Blanketflower release in the area burned by the Cold Springs Fire, July 2018. That question I knew was a bit more questionable. Why? I knew the moth-fire relationship was more complicated than the flower-fire relationship from the research I did for the Forest Service. One of my research sites in that study was an intensely burned area north of Rocky Mountain National Park where there was a strong release of Gaillardia, but no moths. The explanatory hypothesis we put forward then was that the area was a long way from any other recent burn with a concomitant release of Gaillardia. Maybe the moths just couldn’t fly that far, or couldn’t find this small burned patch in the middle of an ocean of unburned forest. That explanation fit with our proposition that the moth was an “indicator species” of the natural patterning of the historic Front Range landscape, when fires were more frequent and the patches of blanketflowers they created would have been much closer together than in today’s fire-suppressed forest landscape. On the first of three visits to the area of the Cold Springs burn, we turned off of the Peak-to-Peak Highway, Colorado Highway 93, just north of “Ned,” as the town of Nederland is affectionately known to the locals, and saw scattered blanketflowers along the roadside in the mixed conifer forest – lodgepole and ponderosa pine and Douglas fir – that is found at this elevation in the Front Range. Gaillardia weren’t common, but we stopped at a wide spot in the road and checked a couple of dozen blossoms. One had a Firemoth hiding underneath the flower. So, we knew the timing was good for adult moths, which are only found for perhaps two weeks a year, when blanketflowers are at the peak of their blooming cycle. We drove on, and soon crossed into an area where the Cold Springs Fire had burned intensely across the road. Some of the burned land was private property and some U.S. Forest Service land. On the private land we saw unburned mountain homes on the edge of completely charred forest; maybe these were saved by the helicopter drops of water or by heroic efforts of local firefighters. We parked on Forest Service land to hunt for moths. And…. a drum roll for science again, please: None. Nada. Not a single Firemoth was to be seen in all of those acres of blanketflowers blooming happily under the blackened trees. We searched and searched, looking at and under thousands of blanketflower blossoms, and saw not one single Firemoth. On Cold Springs Road along the north fork of Boulder Creek, on the north side of the burn where the fire had started, we stopped again to check the scattered blanketflowers along the unburned roadside for moths, and found another one. Blanketflower in the area burned by the Cold Springs Fire, July 2018. After that scouting trip, I went back two more times to the same blanketflower-blanketed areas burned by the Cold Springs Fire with other friends and colleagues to search again for Firemoths, and we still found none. So, in some ways we got an answer that should satisfy me as a scientist – but wasn’t quite satisfying because it left an open question and posed a new hypothesis. There were adult moths on both sides of the blanketflower-fields released on the Cold Springs burn, but the moths hadn’t found that abundant source of their sole food and host plant yet, after two years. What’s going on? Why not? Scientific hypothesis: Give ‘em a break! Have a little patience already! Maybe they’ll find those acres of Gaillardia next summer. For a scientist like me, that’s enough of an excuse for another trip to Colorado next summer. You’ll be the first to know what I find in another episode of “More Colorado Fires and Firemoths,” right here, in July 2019. Chasing Firemoths wasn’t my only excuse for a field trip to the Front Range this year. I was also chasing the answer to another yet-unanswered scientific question, also related to fires. The question (oh yeah, another drum roll for science please! ): How do you tell the difference between a fire scar and a lightning scar in the rings or wood anatomy of a tree? OK, what? This question itself needs some explanation, I know, not only for most readers of this Ecologia blog, but also for most ecologists, and even those who are more or less familiar with fire ecology. It turns out that no one has ever tried to answer this question scientifically, apparently. The question arose in my mind only because of another serendipitous line of research that I fell into a few years ago (my Firemoth research was also serendipitous and fallen-into out of curiosity). It got started when I was working with an international team to try to characterize a fire scar in a 210-million-year-old fossil tree from southeastern Utah. On a hike with my father in the early 1980s, we found a piece of that fossil tree trunk on the slopes below the Bears Ears, near Natural Bridges National Monument. After working with fire ecologists during my Firemoth research, I got good at recognizing the characteristic shape of fire scars, with their healing curls of new wood that grow over the face of the scar. More than a decade after we found the fossil, I thought I saw that pattern on the chunk of fossil log from Bears Ears that my dad then was using as a doorstop. Those improbable links are the serendipity of the story, I guess. Fossil tree section from Bears Ears, Utah, with the first fossil fire scar ever described in the scientific literature. One of my co-authors on the paper we eventually published, documenting a fossil fire scar for the first time in the scientific literature, nevertheless kept expressing his doubts. He kept asking: With only a six-inch segment of a fossil tree trunk showing a scar, how could we tell that it was a fire scar, and not, possibly, a lightning scar? Our literature search found no reports in the scientific literature about lightning scars and tree growth, neither as reflected in the widths of tree rings or in the cellular anatomy of the wood cells that grew after lightning struck. What we saw in the fossil wood of the Bears Ears specimen matched what had been reported for fire scars in modern trees, so we argued that this must be a fire scar on that basis. Our paper was published in 2014, but Dan has still never stopped hounding me with his doubts about lightning scars. 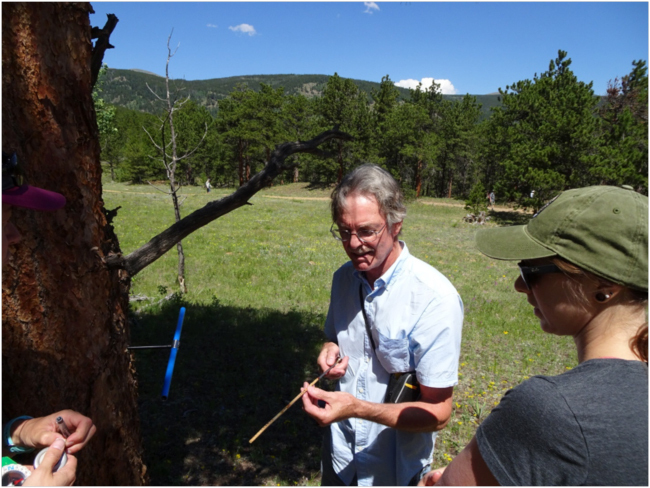 So, finally, when I saw a tree with both a lightning and a fire scar beside the trail in Boulder County’s Caribou Ranch Open Space near Nederland on a cross-country ski last winter, I realized this was the perfect natural experiment for comparing how a tree reacts to wounding by lightning and by fire. I was determined to take cores from this tree to compare how it responded, in ring growth and cellular wood growth, to both of these very different scarring events. Maybe I could finally get Dan to stop bugging me about lightning scars. Ponderosa pine (Tree #1) with overlapping lightning and fire scars, July 2018. Several friends were intrigued by this question also, and offered to join me on a tree-coring expedition to the double-scarred tree. We met for breakfast at Salto in Nederland – remember Salto? – and then caravanned out of town to the trailhead at the Caribou Ranch Open Space. It was a glorious sunny summer morning as we packed up our gear and headed up the trail. We found the tree easily, not far off the trail, and organized our “team” of four to core it and record all of the pertinent data, from GPS location to the compass-angle of the core, and from the diameter of the tree to the height above ground where the core was taken. Ah! This must be real science, right? Research team members extracting a core from Tree #2, July 2018. Sure enough, by some cosmic coincidence – or maybe with some scientific explanation? 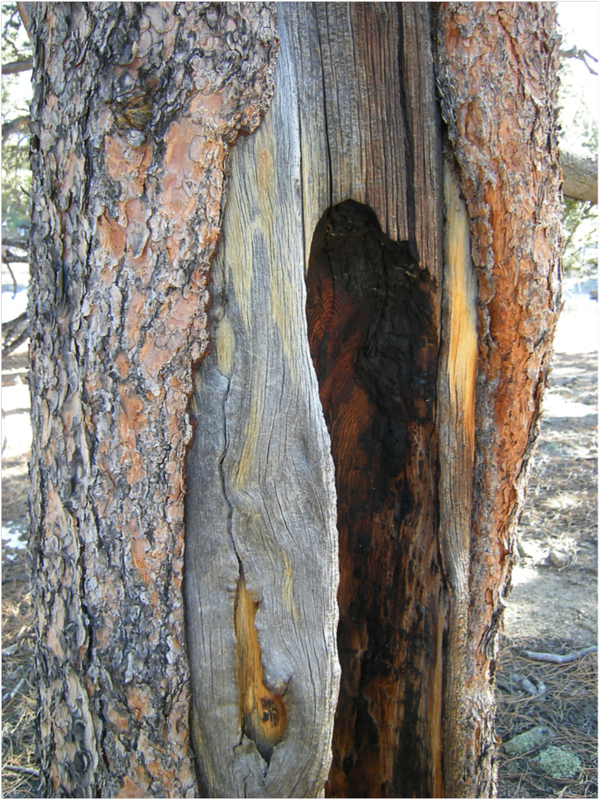 – there was another ponderosa pine with both a fire scar and a lightning scar. A second perfect experimental subject. In this case, the fire scar was on one side of the tree and the lightning scar on the opposite side, unlike on Tree #1, where the two scars overlapped on the same side, the lightning scar oldest, and fire scar later. And while some of us were taking cores from Tree #2, others wandered and found more scarred trees, some with only lightning scars and some with only fire scars. By then it was coming on lunchtime, and we decided to concentrate our efforts on coring the lightning-scarred trees, because it is lightning scars that haven’t been documented in the scientific literature, as I mentioned earlier. My hypothesis is that fire scars and lightning scars will have quite different “signatures” in both ring and wood anatomy. Here’s the idea: Many tree-ring studies have demonstrated that wildfires are often preceded by periods of drought, indicated by a series of narrower rings in years immediately preceding the fire recorded by the scar. And a number of studies have shown that the water-transporting wood cells called tracheids that make up the rings are smaller during periods of drought. Scarring by lightning would not necessarily have any association with drought in previous years. Tree-ring studies have also shown that after a period of recovery from wounding by fire, trees often experience increased growth, called a “growth release,” which is generally attributed to reduced competition for light, nutrients, and/or water caused by the death of nearby trees, and/or to an increase in available nutrients released from burned vegetation or litter. A lightning strike would not produce these ecological effects unless it started a fire, so we would not expect to see growth release following scarring by lightning. Examining a core from Tree #2, July 2018. After lunch, we went to the Cold Springs burn area for another search for Firemoths. Still none. We stopped at Salto in Ned for an iced coffee. The cores we extracted are now being mounted and sanded smooth so the rings can be examined. Eventually the wood cells that grew before and after both fire and lightning scars will be examined and measured. Then maybe we’ll have an answer to the question of whether trees respond differently to wounding by fire and by lightning. And then, when someone finds another fossil scar, maybe they can examine the fossil wood and say: Lightning struck here, 210 million years ago! And Dan will be satisfied that his persistent skepticism led to a scientific answer to an unanswered question. Ah, I love science! Colorado Fires and Firemoths. June 2013. Colorado Fires and Firemoths. July 2015. Fire Scar on a Triassic Tree. November 2013. Picnicking in Deep Time. June 2014. Colorado Fires and Firemoths. Byers, B.A. 2017. 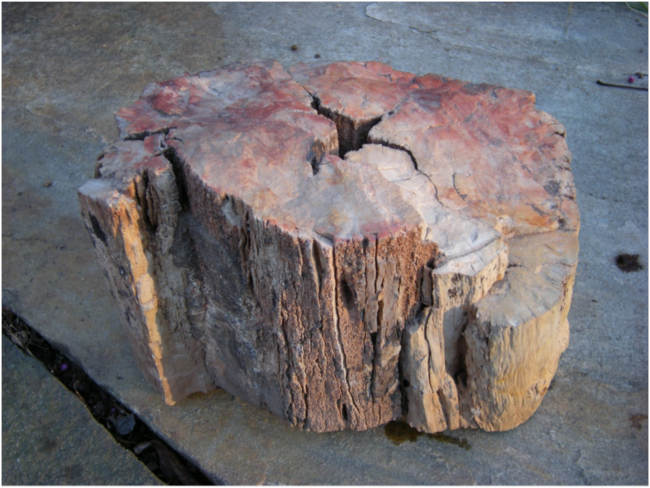 First known fire scar on a fossil tree trunk provides evidence of Late Triassic wildfire. Byers et al., 2014.